Director Lola Kelly and writer Sterling Powers were kind enough to answer some questions about the paranormal thriller. What was the inspiration behind “The Witnessing”? How was it developed? Sterling Powers: I met (the Davidsons) while hiking in Utah in the summer of 2016. I was so fascinated with their story — mainly because they don’t believe in ghosts, and yet they had all of these strange things happen in their home that no one could explain. The story was originally about (Mrs. Davidson’s) experiences specifically, but [sound designer] Rolfe Kent was much more interested in the investigation aspect of it, so we decided to develop that instead. After more than a year of research — gathering data, news clippings, conducting multiple interviews, writing, rewriting, and assuring everyone that we wouldn’t use their real names — I finally handed the script over to Rolfe, Lola, and [producer] Savannah Wheeler. What is the show about? What will audiences be experiencing? Powers: This is a lecture given by the skeptical researchers who were investigating the disturbances in the Davidson home. Audience members will hear stories, see slides, listen to audio recordings, and handle some pretty spooky artifacts. 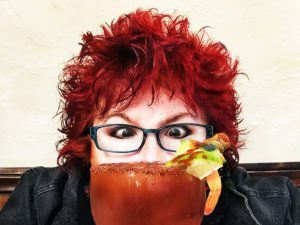 Lola Kelly: The show is based on two real paranormal experts whose mission is to debunk the mysteries of the world through science, and the story is about what happens when they (and we) face things that can’t be explained. The audience will experience a condensed and enlivened version of one of their actual lectures. What makes the piece immersive? How does the audience participate? Powers: The Witnessing breaks the fourth wall without forcing people to participate, which I think is important for a truly bone-chilling experience. In order to feel and enjoy the thrill of fear, you have to first feel safe. Attending a lecture is inherently participatory and somewhat bland, even if you don’t ask any questions. You know that the panel members are talking to you; you know that you chose to be there. It’s not like a Halloween haunted house, where you walk in expecting a teenager with a mask and chainsaw to startle you. This isn’t about jumps, or cheap thrills — this is about making you question your own ideas about what’s real or even possible. I want people to walk out and wonder if their own home might be haunted — even if they never considered it before. Kelly: To me, immersive theater abandons the old proscenium model and allows audience to step into real or spectacular worlds, which our play certainly does. Our show isn’t the most participatory because it’s based on a real life model that is presentational (a lecture), but audiences will have direct address and will be able to handle, feel, smell, hear and question in a wonderful way. What are the skillsets of the talent involved? Kelly: Galen Howard is a really singular performer with decades of experience in film and theater. His take on the real-life assistant is as grounded as it is eerie. He’s recently appeared in the immersive hit The Willows. Jason Paul Field plays our Dr. Daugherty and Field brings an intensity, magnetism and commitment to research that matches the real guy. He’s a classically trained Carnegie Mellon graduate and played Humphrey Bogart in The Blank’s Something Truly Monstrous and a lead in Martin McDonagh’s The Lonesome West at the Ruskin. Given the time restrictions of Fringe, how will the logistics be handled? Kelly: With gusto! We have a small cast but a lot of artifacts and tech to bring in so we’ll be keeping it to the essentials and creating a game plan for the most efficient load in and out. Obstacles always give way to creativity. We’ll also be allowing the audience who arrive early to observe some of the set up if they are curious to take a closer look at the paranormal artifacts we’ll be setting out. Is this the company’s First Fringe production? What makes the show an ideal fit for the Fringe? Kelly: It is the sort of experimental and intimate new work that thrives at the festival. It’s concise and exciting. Since the Fringe is collaborative, are there any other shows you’d like to give a shout out to? Kelly: One Last Thing Before You Go, which is also playing at Thymele Arts. The Witnessing plays May 31, June 15 and 16 and June 21, 22 and 23 at various times at Thymele Arts, 5481 Santa Monica Blvd. It is recommended for ages 18+ and is not for the faint of heart. More information and tickets can be found on the Fringe site.